So, here's the truth about the Boat Challenge. One day I walked into the STEM Lab and decided that my plans for third grade were not going to work and I needed to throw something different together quickly. Then I started pulling junk out of the cabinets. Seriously. I really did not have a plan. I just started pulling things out- waxed paper, foam sheets, plastic wrap, cups, straws, and anything else I thought kids would use. The first class came and we had a grand time, but there were problems. My instructions were for the kids to plan their boat and come to the supply table and collect only what they would need from the vast array of stuff I had on the table. Some groups did exactly what I expected. Some groups came and got some of everything. I mean, if you get all the junk your boat will be better, right? I decided to put a price on all the materials and have the kids "buy" the items. And they had a budget! In the photo above you can see groups filling in their cost sheets. They are using the pricing list I created and then listing the things they will need. Since these were third graders I allowed the use of calculators. As soon as the cost sheet is ready they went shopping at STEM Mart! They were so serious about this. I loaded them down with a tray of all the items and they got busy building a boat. For some reason, kids truly believed foam cups would make a great boat. Just about anything with a flat bottom will work great- as long as they have not made a tiny hole in the materials somewhere. We added pennies until the boats began to take on water. Kids loved to use plastic wrap for the bottoms of the boats and straws, too. They also learned that straws will take on water and make the boat sink a little. Many of the foil boats began to resemble baked potatoes. But, here's a secret: foil boats work the best. Foil has magical flexibility when taking on the weight of the pennies dropped inside. Kids have to think and re-think and they solve problems constantly as they work. Using the budgeting feature is great fun for them and they are so serious about it. I love hearing them dicker over the prices and how many things they need. They learn by doing! Those cup boats flip over and they go back to their plans and use this learned information and try again. Kids dearly love the whole testing event of this challenge. They are so excited to see if the boats will float. Adding weights to the boat to try to sink it is so much fun. I love listening to the kids count the pennies and then cheer when they get to 100. "It's up to a whole dollar!" they will say. 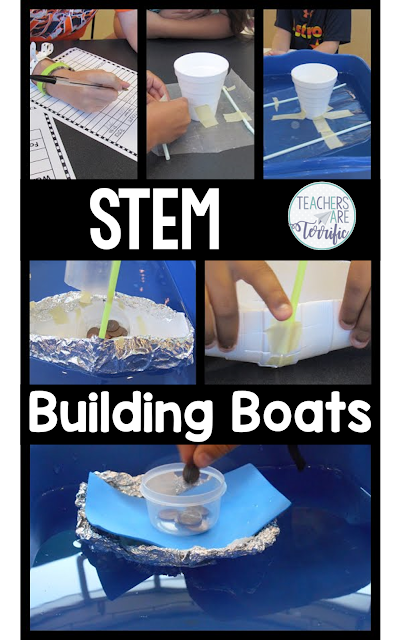 Building Boats is the best challenge ever! Love this! You've inspired me to include more STEM activities into my classroom content time. Thanks for sharing! Yay! How exciting for your students! Have fun! Catapults Bring Cheers to the Lab!